Imagine a scenario where you can’t log into computers or use the telephone, paychecks cannot be electronically processed, emergency services can’t access data or coordinate, front-line staff can’t conduct electronic transactions and service is delayed or halted. Such a scenario could be a cyber breach, where data protection for your customers, students, patients, businesses and others is essential. Does your organization know its cyber risk? For organizations which currently use the Cybersecurity Framework, the Baldrige Cybersecurity Excellence Builder can assist implementation in several ways, including at the senior executive level. It can also help assess the effectiveness of their use of the Cybersecurity Framework. Speaking at a cybersecurity panel at the Baldrige Quest for Excellence© conference, Baldrige Program Director Robert Fangmeyer said the Baldrige Cybersecurity Excellence Builder is adaptable to meet any organization’s specific needs, goals, capabilities and environments. It guides users through a process that details their organization’s distinctive characteristics and strategic situations, and defines the organization’s current cybersecurity approaches. An assessment rubric lets users determine areas of relative strength and weakness. The completed evaluation can lead to an action plan to upgrade cybersecurity practices and management, implement improvements and measure progress and effectiveness, he said. 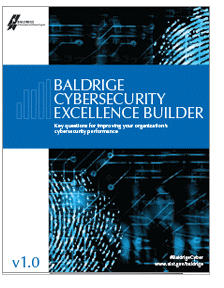 Why Use the Baldrige Cybersecurity Excellence Builder? JoAnn Sternke, superintendent of the Pewaukee School District (Waukesha County WI), speaking at the cybersecurity panel, said her school system uses the Baldrige Cybersecurity Excellence Builder to ensure that it is being proactive, intentional and systematic in how it looks at threats. Pewaukee’s IT Director Amy Pugh added that the school system uses the resource to assess how it is safeguarding student data, personally identifiable data, programming, staff data, payroll, hardware and software assets, the student information system and the financial management system. 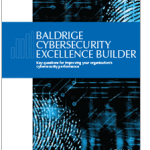 Download a free copy of the Baldrige Cybersecurity Excellence Builder to assess your own organization’s cyber risk. Author: Dawn Marie Bailey is a writer/editor with fifteen years of government service and ten years working for nonprofits. She has a Master of Arts degree from George Mason University and a Bachelor of Arts from the University of Connecticut. She can be reached at [email protected].